Anyone who has bunnies knows that bunnies love to chew! So what's a human to do in order to protect their cords from little bunny teeth? We buy 50 foot rolls of Poly Loom from the NAPA Automotive store for around $12.00. 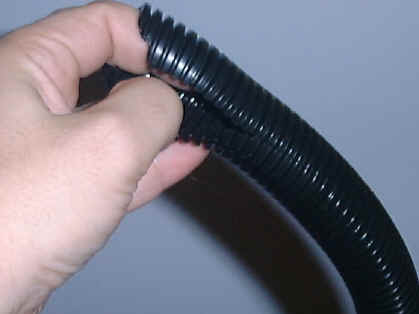 This poly loom is similar to conduit and is used for wires and hoses in cars. The poly loom comes already slit and this makes it very easy to get the wires inside. Organize and lay out your wires. Begin at one end and start sticking the wires in to the poly loom(prior to cutting it to length). Continue pushing the wires in until you get close to the end. Push all the cords in as far as you can to be sure everything is securely inside. When you are sure where you need the poly loom to end, cut it off and stick the final ends of the wire inside. 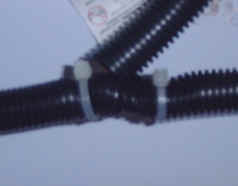 Using plastic ties, secure the poly loom in several spots to be sure the hose won't open and that the cords don't stick out. In the picture below, you can see that we bought an outlet that screws into the wall and allows you to plug things in at the sides. All of the cords are protected and you can see the plastic ties at the end holding it all together and making sure that the cords can't slip. For some reason, unknown to my human brain, bunnies do not chew on this stuff. I don't know if it is the fact that they don't like the texture or the fact that it isn't a solid cords that is easy to wrap their teeth around. 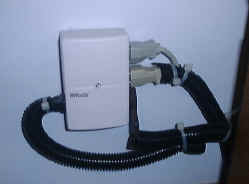 In the picture below (on the left), you can see a section where many cords join together to go off to various locations. We cut some small pieces of the poly look to close off those small sections and then used the wire ties to hold it all together. 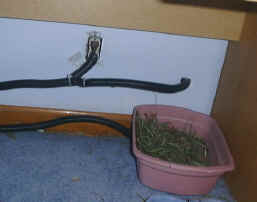 In the picture on the right, you can see under my desk where the cords hang and run across the floor as well as some hay for the bunnies since they like to hang out here. In this final picture you can see what the poly loom looks like as well as the slit that is pre-made in it. I don't think you can appreciate how nice this is unless you have spent hours trying to slice open the fish tank tubing or anything else of that sort!!! If you have any pictures or suggestions to add to this, please email me at mpalevsky@mybunnies.com and let me know, I would be happy to add any additional information you may have.